Organic ROOT StimulatorOlive Oil Creamy Aloe ShampooAloe Vera and Olive Oil are two of nature’s most nourishing ingredients. This shampoo detangles, neutralizes, and moisturizes your hair, leaving it more manageable and soft. It's not simply a neutralizing shampoo, it is the perfect moisturizing and detangling shampoo that conditions while cleansing the hair. Now available in a Pak!Olive Oil Creamy Aloe Shampoo: Moisturizes and neutralizes the hair leaving it tangle free and soft after every shampoo. A rich blend of Olive Oil, Aloe Vera, Panthenol, and Lecithin to provide moisture. When used regularly it can help prevent calcium, magnesium, and iron build-up on the hairKey Ingredients:Olive Oil: Rich in essential fatty acids, it infuses moisture directly into the cuticle.Aloe Vera: A plant whose gel from its leaf is known for healing, anti-bacterial and soothing properties.Directions for Use:Wet the hair thoroughly. 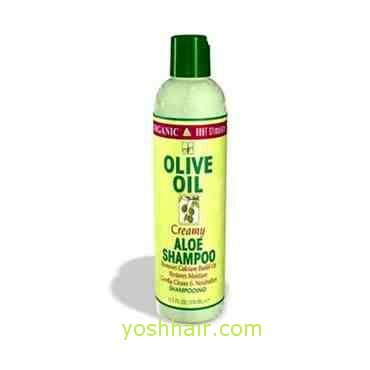 Apply a generous amount of Olive Oil Creamy Aloe Shampoo and work into a rich lather. Rinse hair thoroughly. Repeat shampoo leaving on for 2-3 minutes. Rinse hair thoroughly and towel dry hair. Follow with Olive Oil Replenishing Pak™.Meest verkochte ORGANIC ROOT STIMULATOR producten op een rijtje: ORGANIC olive oil relaxer, ORGANIC olive oil Aloe Shampoo, ORGANIC olive oil Sheen spray, ORGANIC olive oil haarvet, ORGANIC carrot oil, ORGANIC hair mayonnaise, ORGANIC soy oil, ORGANIC jojoba oil, ORGANIC no more flakes, ORGANIC uplifting shampoo, ORGANIC lock & twist gel.Alle prijzen op onze site zijn inclusief 21% Btw. Mocht u willen afrekenen, dan komen er naast de verzendkosten dus geen extra kosten meer bij.GROOT INKOPEN VOOR UW ZAAK?Dit product is ook in te kopen tegen groothandelsprijzen. Vraag naar de voorwaarden. Wilt u kopen tegen groothandelsprijzen stuur dan uw Kvk-nummer, Btw-nummer en adresgevens naar ons toe: yosh@yoshhair.comIndien een product niet op voorraad is, houdt rekening met een levertijd van 6-8 werkdagen. Wij nemen in dit geval binnen 48 uur contact met uw op.